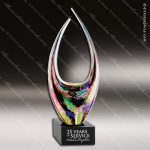 Journal Dual Artistic Multi-Colored Accented Art Glass Dual Rising Trophy Award. All art glass pieces are hand made to ensure no two pieces are identical. With a variety of sizes, shapes and colors, each piece is attached to a black crystal base that can be personalized. This ultra-modern recognition of excellence is a uniquely styled abstract design that will add beauty where ever it is displayed. All art glass pieces are packaged in a lined gift box for added elegance. Joyful Twist Artistic Multi-Colored Accented Art Glass Twist Top Trophy Award. All art glass pieces are hand made to ensure no two pieces are identical. With a variety of sizes, shapes and colors, each piece is attached to a black crystal base that can be personalized. This ultra-modern recognition of excellence is a uniquely styled abstract design that will add beauty where ever it is displayed. All art glass pieces are packaged in a lined gift box for added elegance. Jubal Vase Artistic Multi-Colored Accented Art Glass Vase Trophy Award. Color, motion, texture, dimensionality, and visual appeal are all words to describe this stunning vase. Colors range from vibrant and bright to soft and muted, while the surface of the vase combines smooth and polished with frosted texture. The swirls of shape and color along with the scalloped top of the vase offer the illusion of motion and fluidity. 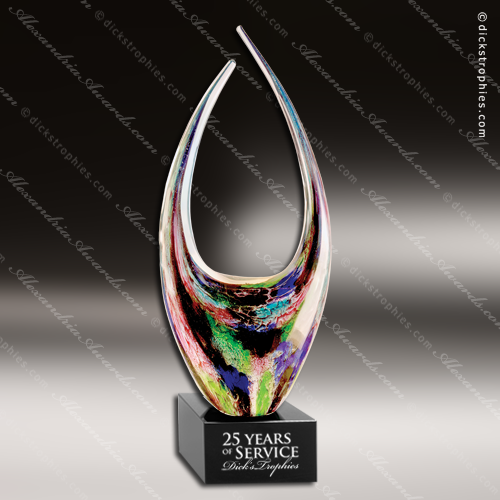 Presented on its own or on a personalized base, each stunning piece is created from handmade blown glass to ensure it is truly a one of a kind tribute to achievement. Jubilee Vase Artistic Multi-Colored Accented Art Glass Vase Trophy Award. Textures, shapes, and deep vibrant colors seem to explode on this art glass vase, and along with the beautifully scalloped top edge give it dimensionality and intense visual appeal. Made of handmade blown glass, these attributes come together to create a piece that is a truly unique, one of a kind acknowledgement of excellence that can be presented on its own or with a personalized base. 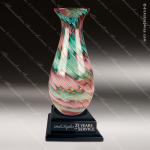 Judson Vase Artistic Multi-Colored Accented Art Glass Vase Trophy Award. Diagonal swirls of vibrant color circle this traditional style vase creating visual interest that is really anything but traditional. Sleek, smooth and ultra-modern, the vase can be presented on its own or on a personalized base for a unique way to recognize achievement and excellence. 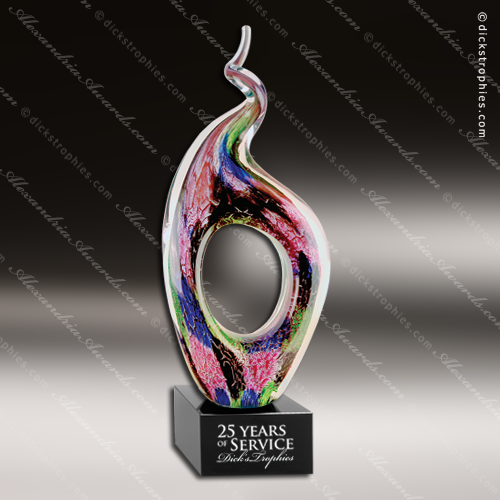 Each piece is handmade blown glass to ensure that the heirloom quality award you are giving is truly one of a kind.